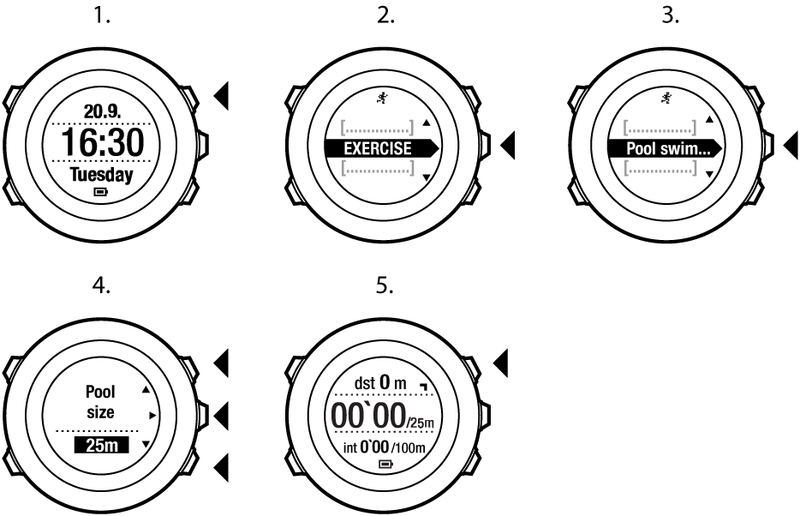 When using the pool swimming sport mode, Suunto Ambit2 S measures your swimming speed based on the pool length. Each pool length creates a lap that is shown in Movescount as part of the log. Press Next to enter Exercise. Scroll to Pool swimming using Light Lock and select with Next. Select the pool size. You can select the pool length from the predefined values, or select the custom option to specify the pool length. Scroll the options with Start Stop and Light Lock and accept the value with Next. Press Start Stop to start recording your swimming log.